Stena Line is one of the largest ferry companies in the world for passengers and freight. They are based in Gothenburg, Sweden. Stena Line has four large ferry’s going in between Gothenburg, Sweden and Fredrikshavn, Denmark. Stena Line also has 2 ferry’s in between Gothenburg, Sweden and Kiel, Germany. You could call Stena Line the Gothenburg Ferry company. 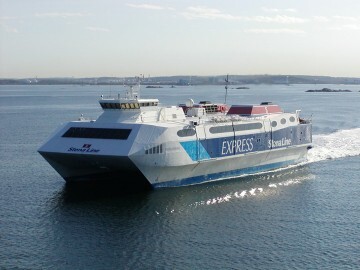 Stena Line Carisma – Express is one of four ferry’s going in between Gothenburg and Fredrikshavn. Stena Line Carisma – Express is a high speed ferry and is the fastest of the four ferrys. It only takes 2 hours to get to Fredrikshavn from Gothenburg or vice verse with Stena Line Carisma – Express instead of 3 hours and 15 minutes like with the other 3 ferry’s on the same route. A return ticket on the route Gothenburg – Fredrikshavn is usally about 150 SEK / per person but the prices vary depending on season. Picture of the Stena Line Carisma – Express leaving Gothenburg for Fredrikshavn. You can easily and cheap take your car with you on the ferry’s which a lot of people do too. If you want to travel in between Gothenburg – Kiel or vice versa you are looking at a travel time of about 13 hours and 30 min onboard Stena Germanica or Stena Scandinavia. Both these ferry’s are modern and offers a sea of things for you to keep yourself occupied with while you are getting closer to your destination. On board the Stena Line ferry’s that do the route Gothenburg – Kiel you will have your own cabin due to the long travel time. A return ticket for the route Kiel, Germany – Gothenburg, Sweden is priced from 950 SEK / per person and upon depending on what kind of cabin you want. Like on the Denmark – Sweden ferry’s you can bring your car on these ferry’s as well for a just a couple of hundred Swedish krones. You can easily book your tickets online over at the Stena Line website.